People say collard greens are the next kale, but why not mustard greens? People say collard greens are the next kale, but why not mustard greens? Their assertive, spicy flavor is incredibly grown-up, and as the weather cools, the greens become especially delicious. Here are 10 ways to use the greens. 1. Casserole. Feeling unsure whether you can handle the greens’ pungency? Start off with this classic treatment, baking them in a cream sauce and topping them with fried shallots. 2. With bacon. Because everything is better than way, right? 3. Frittata. Italians love bitter greens and frittatas, so it makes sense to put them together. Sauté the greens first with some onions, then add the eggs and cook—first on the stovetop, then in the oven—until set. 4. With meatballs. Instead of serving your meatballs over pasta, spoon them over greens. 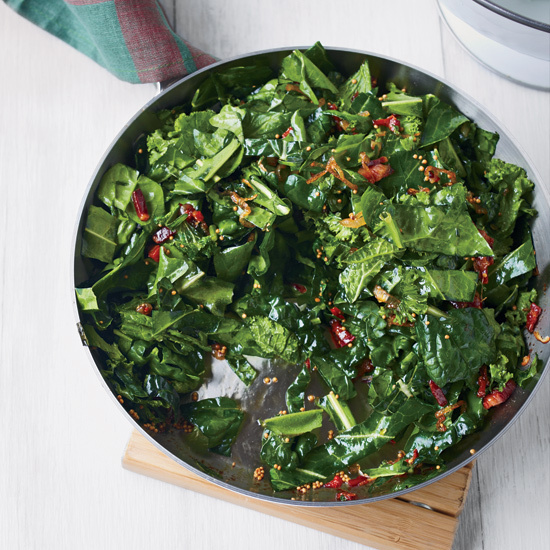 To infuse the greens with meaty flavor, cook them in the same pan. 5. With white beans. Add the greens to a smoky, satisfying white bean stew. 6. Bibimbap. Stir-fry the greens with ginger and sesame oil, then serve them in the spicy, healthy and satisfying Korean rice bowl known as bibimbap. 7. Japanese-style, with fish. Steam a mild white fish over the wilted greens, flavored with soy sauce and mirin. 8. Indian-style. Ready for a greens dish full of invigorating flavor? Blanch the greens, then puree and cook them with garlic, jalapeños, ginger and onion. 9. Italian-style. Cook the blanched greens with garlic and crushed red pepper then finish with a little red wine vinegar. 10. Bali-style. Toss the steamed greens with a fragrant sauce known as sambal matah, made with lemongrass, kaffir lime leaves, lime juice, coconut oil and soy sauce.